Digital transformation is a broad, expansive concept with many nuances that seem to pop up everywhere. Through all the noise, you may have deciphered that digital transformation has quickly become a requirement for businesses, both large and small. Many enterprise companies (such as Microsoft, Kaiser Permanente, and Hewlett Packard) are advocates and proprietors of digital transformation. However, increasingly so are smaller, scrappy startups, ISVs, and partners just like you. With digital transformation, smaller businesses are now better able to identify a customer need and use scalable technology to help new customers in amazing ways. In this blog, I’ll give you a brief overview of what digital transformation means, what the experts have to say about it, and how account based marketing (ABM) is a key component in aligning your company with these new business models. Microsoft CEO Satya Nadella spoke about the importance of digital transformation to Microsoft’s global partners in his 2016 WPC keynote. Satya described the process of digital transformation with four pillars: empowering your employees, engaging your customers, optimizing your operations, and transforming your product or business. Employees need to be empowered to do their best work from anywhere, at any time, on any device. At a recent partner conference that I attended in Australia, I saw numerous partners connecting with each other and sharing demos of innovative solutions online, offline, from Surface devices, and even right from their mobile phones without any loss of that “wow” factor. One mobile demo led to a strategic partnership that will help me measure business impact through marketing more effectively. This all derived from the empowerment that technology has given myself, our partners, and our customers to work seamlessly from anywhere on any device. I challenge you to think about how you can empower your customers with the technology you use every day to focus more on business growth and spend fewer hours on less valuable business operations. Keep in mind that with this new ability to access information from anywhere, protecting your data, wherever it goes, also becomes a priority. Customers are expecting new levels of connections with the businesses they partner with and purchase from. In this digital age, customers are experiencing deep personalization and interactive marketing, as well as enjoying the ability to connect with businesses easier than ever before. With constant connection and personalized interactions, you can build loyal, profitable customer-relationships. By automating these processes you can further boost your sales and service teams’ productivity. Optimizing your business process often starts with your IT infrastructure. Once you’ve divvied up what information you can store where, you can greatly reduce the cost and complexity of IT management with new resources like the cloud. With data backup and recovery, you can be back online in minutes without losing the time and effort you had put into your work. Finally, you can reduce risk, with easier compliance, if you choose solutions which prioritize safeguarding your business. If you innovate with agility, and are open to the consistent changes we see in today’s business landscape, you will be able to adapt quickly to changing business needs. For example, with new data analytics services, you can turn your data into a business asset. Data protection and security is tied to all four pillars and is critical to reinforce, and sometimes lead with, when having a customer conversation around these messages. This is all about making sure that your data is protected everywhere on all devices, that efficient and effective data backup and recovery solutions can bring you back online in minutes, and risk is mitigated with easier compliance services and solutions. Essentially, digital transformation implies leveraging new tools and technologies to change the way your business functions, from product development to customer interaction. In the Digital Transformation panel at the 2016 World Economic forum chairmen and CEOs (from HP, Kaiser Permanente, Alcoa, Schneider Electric and Salesforce) discussed what digital transformation has meant for them, the challenges they’ve faced, and advice to other companies about executing their own digital transformations. Their stories span from innovation in building and quality testing products, to new ways of interacting with their customers. Meg Whitman, CEO of HP, discussed moving to the cloud as being a key step in their digital transformation and has helped them keep up with the fast-paced tech market. Bernard Tyson, Chairman and CEO of Kaiser Permanente, mentioned a new patient-relationships strategy called “Care Anywhere”, which allows patients to connect with clinicians digitally. The opportunities are truly endless. 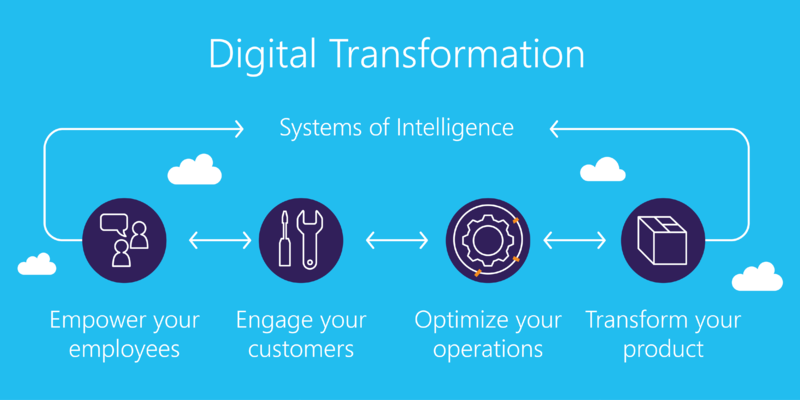 As a Digital Marketing Strategist at Microsoft, I’m very passionate about the subject of digital transformation, and the great success I’ve seen partners experience in implementing these tactics. In my series of blogs and interviews, I aspire to make digitally transforming your marketing strategies accessible as well as highly effective. Leveraging ABM will help you attack some of the biggest challenges with digital transformation by finding the right technologies, updating outmoded business models, and nurturing a modern company culture. Cultivating an open and communicative culture is the key to your success with both digital transformation and ABM. If everyone in your company can remain adaptable and open-minded, you will find it much easier to make the necessary pivots to stay competitive in this rapidly changing environment. To get your footing, and learn how to help start (or enhance) your digital transformation, follow the steps in my blog series, beginning with The 4 Steps to Creating your Ideal Customer Profile and Creating your Targeted Accounts List with Sales and Marketing. Stay tuned for the next steps and additional insights in the coming weeks. Further resources aligned with the pillars of digital transformation are set to hit MPN throughout the coming year. We will serve up case studies, marketing resources, and how-to guides to help you think about how you and your customers can leverage this focus to grow your businesses and utilize the latest technology to change your customers’ lives in incredible ways. I look forward to your feedback and comments; you can also connect with me on Twitter at @Alex_Sessoms. How do you think Digital Transformation will change the way you engage your customers? Share your insights in the comment section below.